iPhone and iPad owners will have much more fine-grained control over their location privacy in iOS 8 thanks to new Location Services options that allow users to determine exactly when —and if —an app can find them. 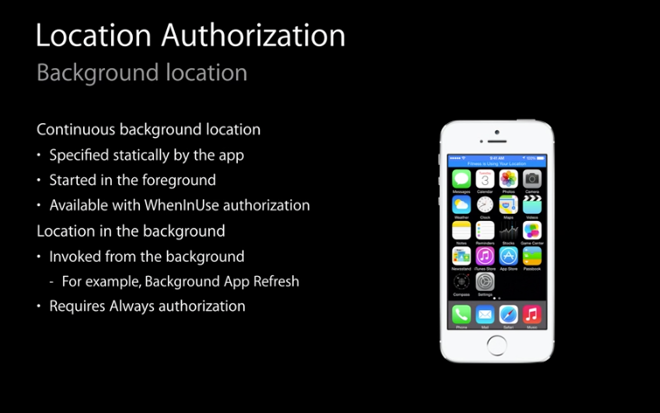 In iOS 7, users could turn Location Services on or off on a per-app basis, but there was no way to control when the app could take advantage of that permission. Apple has expanded on that binary choice in iOS 8 and now allows users to grant location access to apps only when they are in the foreground. The new "While Using" option —known to developers as "WhenInUse" —still lets apps use background location functionality, but it must be started by the user within the app —for instance, a running app with When In Use authorization can track a user's progress while the app is in the background only after the user has explicitly told it to do so. Alongside the new authorization level comes a number of changes to the way users are notified of location requests. First, Apple now requires apps to explain why they are requesting the user's location in the initial authorization prompt. 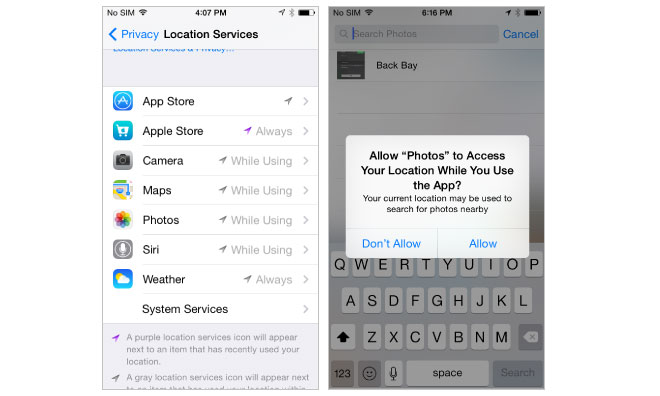 The built-in iOS 8 Photos app, for example, tells users that their "current location may be used to search for photos nearby" when requesting access. Second, apps with "While Using" authorization will display a bar at the top of the screen when they are tracking the user, similar to the bar shown by VoIP or turn-by-turn navigation apps. Tapping the bar will take users to the app. Third, users who grant apps "Always" access will be prompted to review the apps' authorization a few days later. The prompt will come in the form of a popup dialog that tells the user that the app has been using their location in the background and asks if they would like to continue allowing that to happen. No matter their authorization level, apps will continue to trigger the Location Services arrow at the top of the display. In closed sessions at this week's Worldwide Developers Conference, Apple touted these changes as giving users "complete control of location usage." The moves —which require minimal modifications by developers -- appear to be fit into a broader push by Apple to give its customers more peace of mind as the company pushes into new areas.